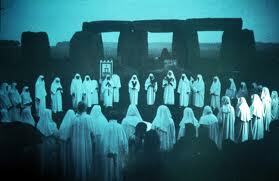 Be like the Druids? You can! KEN KORCZAK: The ancient Druids — the real Druids — are largely a mystery to us today. What passes for Druidism today is almost certainly a modern interpretation of what we thought the Druids were all about. After I read Peter Berresford Ellis’s book, “The Druids”, I realized how difficult it is to really know what these ancient people were really like. Records are spotty, and most of what we think we know about the Druids comes down to us through early Roman historians — and they hated and reviled the Druids, and most likely painted an inaccurate and unflattering picture of the them. Well, one thing we can almost be certain of — the Druids held the oak tree in very high esteem, and they almost certainly ate just gobs of acorns. Back then in Druid times, the Britons were covered with oak trees, some of them giant oak trees, and acorns must have been a major, major source of food for the ancients.